In the high north, deep beneath the sea ice, sequestered within the sea bed, sleeps a monster. A massive store of methane that is the relic of ages past. A beast whose vast body is composed of hundreds of gigatons of this climatologically volatile gas. Since times immemorial, the monster slumbered. Accumulating vast size and girth through a near constant rain and sequestration of biological material as the long ages passed. Until human time, that is, when an unprecedented warming began to prod the monster to waking. And so, during recent years, the monster has stirred, even as more and more of this gas has been observed escaping into the atmosphere. What is happening can be compared to the, at this time, slow initial rumblings of a climate volcano. The gas, forced out of its icy traps in the sea bed, escapes into the ocean where it destabilizes the sea bed and wrecks jarring changes on the marine environment. It bubbles up beneath the ice, running along beneath the strong ice to find holes where the ice is weak, or escaping out from under the ice edge. And in these places, it runs out into the atmosphere. There, the gas is between 20 and 100 times as potent a warming agent as CO2 by volume. There, it inevitably adds to the human warming and emissions nightmare now underway. In other places the tundra thaws, unleashing its own monstrous volumes of methane, adding to the giant emerging from the troubled seas. We have seen the large and growing escape of methane in the great 1 kilometer plumes in the East Siberian Arctic Shelf and in other large releases off of Svalbard. We have seen them in the 150 kilometer atmospheric plumes observed by NASA’s CARVE study. We have seen them in ‘hot’ melt lakes that bubble with methane dense enough to burn. We have seen them in the explosive Arctic fires that burn the thawing and volatile land itself. These all-too-obvious hints of steadily increasing emissions are ominous, not only for their current warming contribution, but for the potential of an even more rapid and violent release. For the eruption of the methane monster, though somewhat gradual now, could, in the build-up to an immense disaster rarely witnessed on Earth, evolve into an ever more deadly and rapid release. There is evidence of such events in the geological past. Events that have left their black fingerprints splattered over most, if not all, of the climate mass extinctions. And there are a handful of leading scientists who are very concerned that such an event may well be in the offing. Unfortunately, 2013-2014 marked the continuation of a dangerous trend where, once again, rates of Arctic methane emission were shown to increase markedly over those seen during previous years. 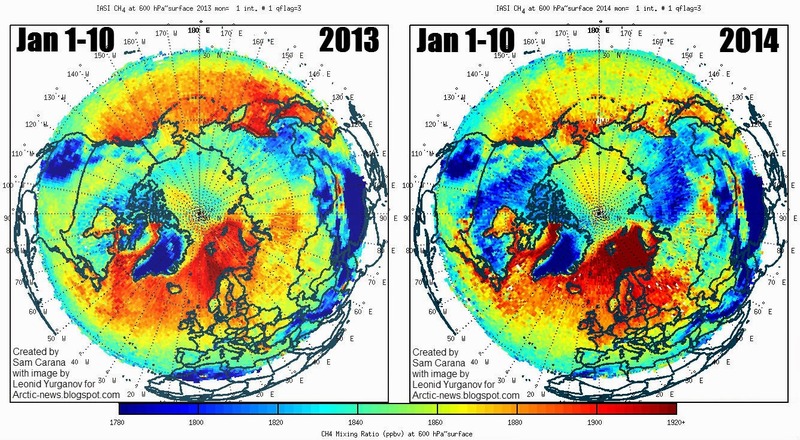 In the above series of enhanced Aqua satellite images, provided by Dr. Leonid Yurganov you can see the steadily increasing volume of atmospheric methane in Arctic regions during a time of typical methane peaks in late January from 2009 to 2013. A more comprehensive slide-show ensemble displays Arctic methane increases from 2003 through 2012 here. It is is worth noting that top scale values were 1870 ppb in this video series. In the more recent series (images above and below), the scale has been increased to a maximum value of 1920 to account for spiking atmospheric levels. So don’t let the moving goal posts fool you! These images, also provided by Dr. Yurganov and composed by Sam Carana, show substantial levels of methane increase for the Arctic during early January of 2014 when compared to the same period in 2013. Especially of note was the significant increase in methane concentrations over the Barents Sea where values were consistently higher than 1920 parts per billion. It is worth mentioning that during 2009, the same region saw methane levels in the range of 1870 parts per billion and that the jump of +50 ppb or more during this interval is roughly consistent with global average increases. What is more concerning, however, is that these maps clearly show this region of the Arctic as a primary methane hot spot, indicating the likelihood of a very large emission seeping out from under the ice and up from the depths of the ocean. Overall methane spikes in the Arctic were very significant with, according to observations from Methane Tracker, values exceeding extraordinary levels of 2400 parts per billion in local spikes. 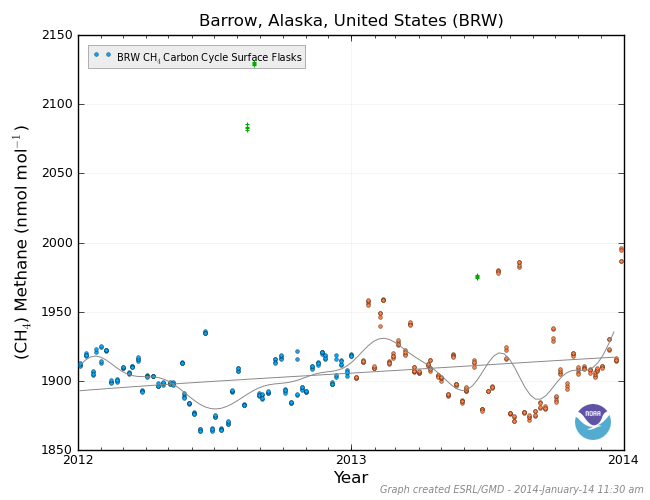 Note that local methane levels at Barrow, Alaska on the Arctic Circle have risen from an average of 1895 ppb during early 2012 to about 1920 ppb by early 2014, an increase of more than 12 parts per billion per year. 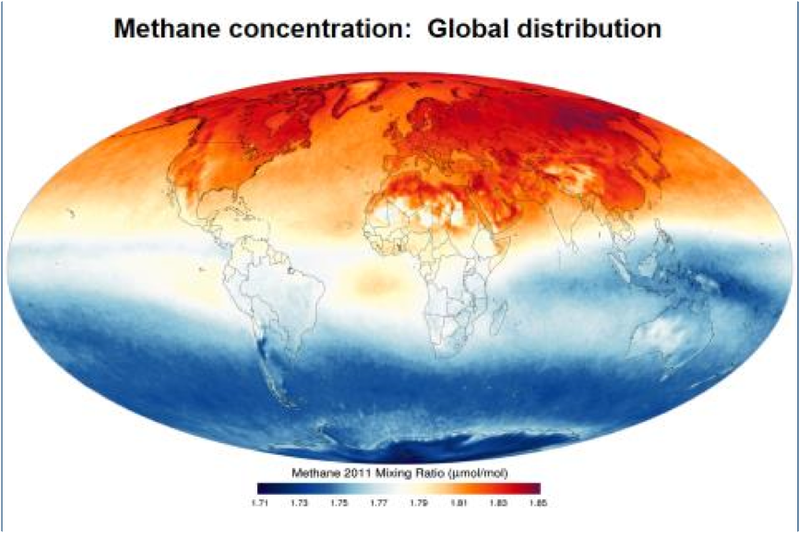 Globally, methane levels have also been on the rise. The record at the Mauna Loa Observatory is now closing in on 1840 parts per billion and shows a significant upward curve during the past two year interval. Though not rising as fast as regions close to the large Arctic emissions sources, the Mauna Loa measure shows a jump of about 15 parts per billion over the two year interval from early 2012 to early 2014. 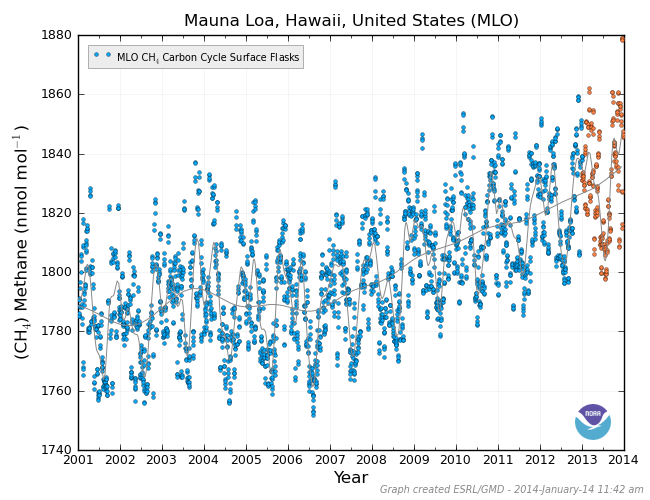 Above we can see the global trend line for methane as measured at the Mauna Loa Observatory. Note that methane increases had slowed during the period of 2001 to 2006. But in 2007, at about the time Arctic sea ice began its rapid retreat, methane levels commenced a rapid rise. Of particular concern is the gradual upturn in the global average methane curve leading into early 2014. As methane levels have continued to rise throughout the Arctic, so have winter temperatures. During 2013-2014, abnormal Arctic winter warmth, especially over the Arctic Ocean, the Barents Sea, and the Bering Sea, has played havoc with Northern Hemisphere weather. In early January, a spate of intense Arctic warmth collapsed the polar vortex, shoving a powerful remnant low southward and setting off a 20 year cold snap in the US. The same extreme winter weather pattern that has impacted much of the US also unloaded a fusillade of storms on the coastlines of the British isles, breaking thousand ton rock structures and reshaping seemingly impervious coastlines. In this case, the added methane release contributes to polar warming amplification and, at this time, is setting in line a series of increasingly violent weather events likely to ramp up over the coming years and decades. In such cases, the methane monster’s contributions to warming cannot be detached from the changing climate as a whole. In fact, it is the kind of amplifying feedback that makes our situation far more dangerous. Note the extreme temperature anomalies over the past 30 days throughout much of the high Arctic with extremes ranging from 2-6 degrees Celsius above the, already warmer than normal, 1981 to 2010 average. This is just the kind of heat, in conjunction with rising greenhouse gasses, that we would expect from an Arctic undergoing dangerous, if not yet catastrophic, change. Given the evidence showing an amplifying methane signal coming from the Arctic, a signal that becomes louder with each passing year, it becomes more difficult to cling to the comfort provided by a number of the more conservative scientists on the issue of methane release (hydrates, compost bomb or other). Though we have not yet seen major releases large enough to push global methane levels higher by 50, 100 or more parts per billion per year (as we would see during an exceptionally catastrophic event), what we have seen is a growing Arctic release that remains a serious cause for concern. In such an instance, we might be wise to compare the Arctic Methane Monster to a massive volcano. One that continues to rumble even as it releases ever greater volumes of its climatologically volatile and heat-contributing gasses. As anyone living in the neighborhood of a volcano can attest, it’s generally not a good idea to ignore such things. In this case, the monstrous volcano is so large as to make all the Earth its neighborhood. So we should all be paying attention. I have now become “exhausted” after going through optimism to neutral to pessimism. I literally have no idea what we should do besides posting comments, read blogs etc. I have alienated many people, as peak oil, climate change discussions scared/bored them off. I do not see any scientist (taking public actions )/politician doing anything about it. It is already past mid night in India. Today is my birthday, and I am readying your blog as my birthday present. You can imagine…..
Btw, I already shared these videos, but sharing them again. Happy birthday, Sourabh. I honestly think you should do something fun for yourself. I retain a fading hope that we MIGHT be able to change our course. Time is running out, though. 8 more years of bau and we are in deep trouble, in my view. Thanks for the videos. I’m wondering if those currents are transporting methane out of the ESAS, beneath the ice and into the Barents where we’re seeing those methane spikes. The added fresh water at the surface deflects more heat toward the ocean bottom. Good illustrations of mechanisms that are likely increasing risks of methane release. That’s the point where, according to even the most conservative scientific estimates, at least 2 C of warming is locked in. It is also the point, roughly, where the feedbacks that we now observe to be amplifying get quite a bit stronger. The number is a bit arbitrary. 5-10 years would be a better estimate. But humans cling to single numbers. So I’ve used this one for emphasis. In short, after about 8 years there is very, very little wiggle room (at least from the climate standpoint). There is always something you can do – and I can’t say it is doing a lot just to blog and speak to people unless you are a good communicator (I am not) and it is really the most effective thing you can do (reaching either a large audience or influential ears would be a requirement to call it effective). For me – I am doing my level best (however poor it may be) to try to prepare a contingency plan for civilisation against absolute catastrophe (you can find a little more on my blog, which I seldom update). For most people – perhaps the first step is to learn to let go. Let go of your world. The end of your world is not the end of all worlds, so stop acting like it is. Easier perhaps for people who never had anything to let go of the things they never had – and as someone who did not have a lot perhaps I don’t understand well why so many people are so attached to the disgrace that is the modern world. I think it is this inability of many people that leads to them to dogmatically cling to the notion that their world can be saved and to ignore reality. This ignorance undermines hope for plans and actions that might actually be relevant to the reality we almost certainly face. Furthermore by acting as though all worlds end just because their world ends, I see people move into defeatism. 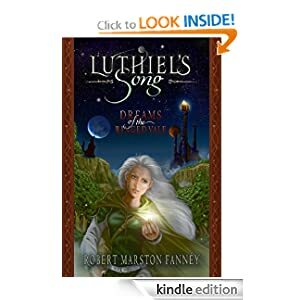 Their world cannot be saved, and so why should any world be saved? I find it irritating at one level and yet appreciate it at another. If there are so few people willing to let go of their world and so fast to just give up – human population will crash below new carrying capacity all the faster when collapse arrives (just unfortunately to a much lower technological floor due to the inaction of most – every silver lining has a cloud attached). CCG: your comment got me thinking about this, one of my favorite songs. Not because I suscribe to any sort of organized religion – I don’t – but because of certain of the sentiments expressed in it. And they did get him. Thanks for the advice. I have learned to let go. I have quite well aware of Eastern Philosophy of letting things go or become “unattached” to the worldly desires. After reading Hansen’s book, I have actually started practicing sort of spirituality, as I have become aware of the fact that little can be done to ‘save’ the world. I have another a broader perspective. The problem is that you cannot prevent any civilization from collapsing. Just imagine all ancient societies. They did not have any industrial tools or machines, yet they consumed their natural resources beyond carrying capacity. They literally did not have the population, societal size, economy, or trade to the extent our industrial economy allowed us to achieve. Even after that, those civilization degraded their environment. Those changes were rather local. Now, we are causing global changes with industrial tools and machines. Even if we switch to 100 percent renewable, I don’t think that our world/civilization would survive as I find it in human nature to consume as much as we can. Only sustainable way of living is live like tribal peoples by becoming part of ecology. But, as long as we have technology, ego in human nature would prevent us from becoming part of nature. SourabhJain: Cultures don’t have to be “civilized” and technology doesn’t have to be extractive. Science we don’t understand looks like magic. SourabhJain: Also, we are part of natural communities, not “ecology” or “ecosystems”. These are distancing and mechanizing terms. We evolved for a couple million years as part of natural communities, and to think we can suddenly throw that off is pure craziness. Also, I really liked your comment. We have a long way to go if we are to stop doing harm. Switching to renewables is just one step in a long, long process that human beings, in my view, need to very seriously work to complete. Good discussion. And I agree, in most part. What is it that we cling to, the billionaire super-rich? The 70 billion animals kept in undersized cages each year only to be killed to fuel a PR-driven fixation with meat? Being a slave to a cell phone and feeling forced to respond to work emails at 11 PM or 2 AM when you would rather be sleeping or spending time with your wife? Working at a job where humans are considered a resource? In any case, if the tech is based on fossil fuels, it will surely go, one way or the other. @SourabhJain – I would question the view that ancient civilisations collapsed primarily as a result of unsustainable practices. While I grant you may find examples or it may have been a significant factor in some cases (these things are often complex) I would argue that in order to have lasted the thousands of years they did – some of those civilisations must have been doing something right (modern civilisation is only a few hundred old at very most). I would argue that climate change (for instance periods of truly exceptional drought) and external attack (invasion by outsiders) were major factors in the demise of many of those peoples. I’d pick the native Americans as a group that demonstrated a true ability to live indefinitely with their environment. The historic Inuit and ancient Egyptians probably score fairly well too. Let me first share something else. I watched a presentation given by the author of Catching Fire: How Cooking Made Us Human. I also read an article co-authored by him: http://www.pnas.org/content/108/35/14555.full. He argues that cooking, which requires energy for food processing either mechanical, chemical etc. made us human. Cooked food reduced eating and chewing time and provided more energy in addition to many other evolutionary benefits. But, what I find very interesting is that cooking drastically reduced overall feeding time (we spend 4.7 % as compared to 47% of daily activity we should be spending based on our body mass). It appears that cooking in certain way significantly increased human’s EROI (energy return on investment). Now imagine, you were a hunter gatherer (or a true raw foodist) who was spending 5-6 hours from hunting to eating uncooked vs. someone who was spending 2-3 hours for hunting and cooking to eat food. Cooking gave you 2-3 hours extra everyday, which you could spend on other activity such as art work, socializing, or hunting more for future stock. If an entire group of people started cooking their food, then entire group would be left with extra 2-3 hours daily, which they could use for some common social activity. To put that into modern context, if you start eating uncooked food or raw food, you may not have much time for your job, entertainment, fun, or writing blogs on internet. Currently, you may spend 1-2 hours eating. What would your standards of living or daily routine would be if you had to spend 4-5 hours a day hunting and eating? Can we still maintain such a complex society? Every hour of our modern life style is energy and power dense. Renewable can provide us energy equivalent to fossil fuels, but not power (how fast you can do something). I think we can definitely live sustainably, but 100 percent renewable society would rather be localized not globalized. You might wanna read works of Dr. Charles Hall on EROI. A basic society need at least EROI of 10:1. Fossil fuels provided 50:1, so we became very complex and globalized. Therefore, I do not think we can have so much globalization and technological advances without energy dense fossil fuels. The main point I am trying to make is that without fossil fuels, we can be sustainable, but our standards of living would be much lower than today’s. The size and complexity of our societies will become simple and local. I think we cannot run modern technologies on renewable energy. All servers, internet, wifi, research labs, computers, networks, need huge energy to function. As i remember, we discussed it before, and I agree to disagree. As far as I know, maintaining such huge physical infrastructure is almost impossible if we use solar, wind, and biomass only. So, this is what I meant by a culture, where everyone was spending some free time with other members, which would not be possible if they ate uncooked food. Now, I think we have been biologically evolved to eat cooked food. If we do not eat cooked food, we may spend more time looking for food, which will leave us almost no time to socialize, thus leading to formation of smaller groups such as tribal communities. Furthermore, a large group would quickly exhaust natural resources of local area unlike smaller tribal communities, and will have to migrate somewhere else. I don’t know much about Anthropology, but frequent migration of large group would have been logistically challenging. So, they settled and started farming (I do not which started first), but I call such settlements a civilization (or civilized culture). Now, if now farming required land, cooking required wood for energy, when they ran out of wood, eating uncooked food would be very challenging causing civilization to collapse. By collapse I mean, drastic reduction in size of community and social activity. I agree, but degraded environment made those civilization far more sensitive to natural climate change. Native American were sustainable, but look at their way of living. First of all, they did not invade many countries. I could be wrong, but they did not built ships/giant houses that needed wood. So, living sustainable requires becoming part of natural system. If you built weapons and ships, it required lots of wood causing deforestation that made local system susceptible to flood or drought. You may find this article interesting. Natural resources definitely played a big role, directly or indirectly, in deciding fate of any civilization. Oh we can most certainly run technology on renewables. My lap top runs on electricity. Today it runs on solar power. Wow. The argument that renewables can’t generate power for tech is moot as moot can be. Because, well, they do! May as well go kiss David Koch and tell him you love him. I meant entire supply chain system and infrastructure. I know you can power your house, appliances, car using renewable energy. I am trying to find if you can manufacture those in the first place. Can you manufacture your laptop through renewable energy? Can you manufacture solar panels/wind turbines using renewable energy? Can you transport material using renewable energy? Can you manufacture large internet servers/networks/processors using renewable energy? Can you built highways using renewable energy? Can you built cars, houses, appliances using renewable energy? Can you build large/small batteries using renewable energy? I do not know answer to these questions. I am reading about thermodynamic limits to sustainable development to find answers to these questions. The following article found that solar is much more sustainable than biofuel. I am looking for more studies similar to this one. I am in no way opposing or skeptical about renewable energy. But, I would like to know physical/thermodynamic limitations to sustainable energy systems. There are countries that generate more than 50% of their energy from renewables. It’s getting easier all the time. As an example, if you took the world’s renewable energy generation and compared it with historical levels, the total generation would be roughly equal to that of the mid 20th century. So even if all the world’s non renewable energy were to disappear, we’d still have that much energy. Would such a scenario be very difficult? Yes. Would it result in doomsday? No. The renewable energy issue is no big deal compared to climate change. The fossil fuel interests, who wish to prevent this, ultimately cheaper and easier to use energy source, from hitting markets have created a myth of its lack of usefulness or usability. The “Arctic Methane Monster” is an ominous signal that the relatively stable climate which gave rise to human civilization is seriously out of balance. Although methane does not remain in the atmosphere nearly as long as the primary greenhouse gas (carbon dioxide), it is a much more potent trapper of heat. What consequences this anomaly poses in the short-term is unclear. The total global methane increase is currently equal to about a .5 ppm CO2 worth of forcing each year. Its effects, however are unevenly concentrated in the higher latitudes and contribute markedly to polar amplification. The Arctic methane emission, being a substantial contributor to the global methane increase therefore hastens global warming by adding additional heating feedback to the human forcing already in play. Such a consequence is bad and dangerous but not, at this time, catastrophic. Geoengineering (the “non-existent” aerial metals spraying from planes that are plainly visible when people look to the skies) is a controversial practice being carried out all over the Earth. According to geoengineeringwatch.org, the spraying is causing a vicious cycle of warming, melting, warming, that will continue unless the aerial spraying is stopped. Climate scientists claim the aluminum, barium, strontium and other ingredients sprayed into the atmosphere reflect the sun’s rays and cool the planet. It is essentially a grand, grand experiment which the people have no awareness of nor been asked to consent to. No politician has addressed the legitimate concerns of millions around the world on geoengineering. What are your, and your readers’, thoughts on geoengineering as a cause of methane releases? I have no knowledge or evidence on large-scale and/or currently ongoing geo-engineering. I’ve seen instances of individuals seeding oceans with iron or attempting other quackish schemes. But, that said, if there is a large-scale effort out of the public eye, then it’s a well held conspiracy. And I’m generally not open to suggestions of such (chemtrails etc). Further, if such were ongoing, it would come up in aerosol and earth energy balance observations and estimates, which it hasn’t. That aside, my opinion on geo-engineering is that it is a very dangerous game. Injecting large quantities of previously non-present substances begs the curse of unintended consequences. Increasing aerosol content through materials or chemicals has a number of strange and dangerous effects. Further, over time, it would be subject to diminishing returns. Lastly, even if it did reduce forcing, we still end up with dangerous atmospheric changes. My opinion is that large-scale mitigation is far more effective than geo-engineering. Unfortunately, we are hitting the point where an all hands on deck approach will probably be needed and that some emergency geo-engineering may be necessary. People can find information at geoengineeringwatch.org then make up their own minds. It is interesting to note that those involved in research have tons of photos and video from around the world, measurements of soil/water levels of metals, etc. My take is that it is a significant factor and must be stopped. I agree with your point about “all hands on deck” as well. Fair enough and thanks for the measured comment. That said, it remains quite clear to me that the chemtrail conspiracy theory is full-blown misinformation. I was once prompted to look into the great chemtrail theory. It took me about 20 minutes to satisfy myself as to this being a great red herring, and a well funded red herring. My suspicion turned to the Fossil Fuel Industry dirty tricks campaign. Especially as those who pointed me in the direction of chemtrails, were all right wing politically, and global warming deniers. I was told I was an idiot for not knowing the government was behind chemtrails and the global warming issue. Honestly, I seriously looked at the chemtrail evidence. I am 99% sure this is a fiction made up by the professional Public Relations firms who work for the Fossil Fuel Industry. A Red Herring used to take attention off the real science and onto to this fake science. This is aimed at the general public, not the science community. You get it? A clever way to divert the debate over global warming onto a fake side issue. This is one of many tactics of the denial profession, all be it, a pretty pathetic one. One wonders why chemtrails are so popular with right wingers and anti science people. As for the above article on Arctic Methane. Nothing could be more threatening that this vast store of methane, under the sea and in the tundra. You don’t need much physics background to understand the threat, and it’s signal of warning. The readings are saying, “The arctic sea water is warming, the tundra is thawing, thus, the methane is going to be released as gas. I remember on Russian arctic scientist as remarking he had seen several methane plumes of a 2 kilometer width, where to year before the plumes were measured in meters! Many of us wonder what the US Government REALLY is thinking and planning. We know that public politics is one thing, but behind that front, the government has the great minds of science at their finger tips, they have to KNOW the real state of affairs. Perhaps even better than us who follow the science with great care. What does this say about our leaders. They have to know the worst is coming soon, I served in the military, I know what goes on at the top levels, and they KNOW this is real. Then there is CIA, their JOB is to KNOW what is real and what is not. I know for a fact they have told government and the military what the REAL situations are. So then, what is our government playing at, supporting fracking and tar sands and deep water drilling. What is their game? RE your comments on chemtrails — Bingo. It’s just an enormous distraction. Sadly, it works. I know people who are eye-deep in this conspiracy theory and the government hatred that tends to go along with it. I think we tend to have this illusory view of government as this singular, powerful and almost infinitely knowledgeable entity that has perfect communication with itself. Nothing could be further from the truth. The military may well be extraordinarily aware of the risks involved, the CIA as well. The scientific agencies, as you we’ll know, have various individuals who all may well hold differing opinions of dangers and risks. Some may see warming as less of an immediate danger, others more so. The issue of methane release remains very controversial among scientists, particularly for those who rely more on models and less on direct observations. Meanwhile Congress is full of people who are ideologically pre disposed to ignorance, to simply fail to understand the science. The fact that many scientists hold differing opinions will only serve to reinforce the false confidence of these individuals, as they tend to, dully, perceive a variety of opinion to be a sign of uncertainty. Meanwhile, these same individuals are regularly briefed and misinformed by their industry backers who provide a constant flow of communications and materials, which serves to further water down understanding. The President, meanwhile, is somewhat vulnerable to the same. The added caveat is that a massive amount of information flows into the executive branch and it is difficult to separate the wheat from the chaff. This combination makes our government very vulnerable to being blind sided by out of context crises. On fracking and tar sands… It is important to consider that the US is still fighting to make adequate energy supplies available for ‘economic growth.’ The political problem here is that for more than a decade and a half growth has primarily benefitted only the wealthy. So it becomes somewhat untenable to pursue a policy that increases environmental damage, that harms everyone, to the sole benefit of the wealthy. In this case, the government, for the most part, is living in a hologram primarily constructed by special interests. In such a case, the government is almost as much a captive as the rest of us. A conspiracy of nothing at all but greed. Plus, regardless of what the government powers actually think, they will only act in a reactionary fashion. This is particularly true in modern market democracies which believe that the government simply acts as a tabulating instrument of the various interest groups. I have read a few climate threat assessments produced by global military powers and they are all on the severe side: 500 million – 1 billion displaced by rising sea levels, 2 billion without access to clean water, worldwide famine, rise of global war and so on. Yet without a doubt they are written as if history is deterministic and therefore concentrate solely on the strategic responses to these events as they unfold. In general, this sort of thought is obsessed with power and sees everything as a zero sum game. They would rather be king of the decrepit than earl of the prosperous. This is most nakedly seen in arguing that the US cannot reduce CO2 emissions until China does because then China will have an “unfair advantage” and leverage it to gain more power. Oh, the zero sum game thinking is about as terrifying to me as neo liberal international relations theory thinking. It’s all terrible and terribly oppressive. And yes, the military at well know what’s going on, but their ability or even willingness to enact helpful change is severely limited both by their function and by the terribly misinformed, ineffective leaders presiding over them. My opinion is also that effective response to climate change requires compassionate, cooperative response. So any gamesmanship pretty much sabotages action from jump. We need to stop serving ourselves so much and start serving each other. Leaders and the wealthy, most of all, need to learn this. Yeah, and the China excuse is pretty much moot. The Godzilla zombie juggernaught riding on the back of neo liberalism turned that country into a worse example of environmental and labor abuse than even the US. So comparing the US with China is like the 8th hell making an excuse not to improve because the 9th he’ll is only somewhat worse. And the chemtrails guy is gone. More polite than most, but there’s still no excuse for peddling misinformation. My advice would be — efforts better spent preventing the fossil fuel giants from making life impossible for us, our children or our grandchildren. The glacier “has started a phase of self-sustained retreat and will irreversibly continue its decline,” says Gael Durand, a glaciologist with France’s Grenoble Alps University. Thousands of homes across the country’s south-east are without power as the city of Adelaide prepared for record temperatures on Thursday in excess of 115F (46C). Forecasters say the heat in Melbourne will be worse than expected with temperatures on Thursday of 111F (44C). It’s a rough heat-wave year for Australia. Not the worst, but still a very bad one. ALL PROBLEMS ARE LEGAL PROBLEMS & ONLY TRAINED LAWYERS CAN SOLVE THEM. LAWYERS IN BLACK BATHROBES KNOW WHAT TO DO. HOSANNA, SAVED BY THE SACRED LAW & LEGAL PRIESTS. Wood writes that environmental law has failed us. Her work exposes the dysfunction of current environmental law and offers a transformative approach based on the public trust doctrine. The trust doctrine asserts public property rights to crucial resources. At its core, notes Wood, the doctrine compels government, as trustee, to protect natural inheritance such as air and water for all humanity. Ultimately, Wood’s book teaches the reader how a trust principle can apply from the local to global level to protect the planet, offering a new framework for environmental law. “Nature’s Trust” already has received numerous positive reviews and endorsements from some of the world’s leading environmental thinkers including James Gustave Speth, author of “America the Possible: Manifesto for a New Economy” and former dean of the Yale School of Forestry and Environmental Studies. “What ‘Silent Spring’ did for our perception of the environment, ‘Nature’s Trust’ should do for our perception of environmental protection,” he noted. Wood is the Philip H. Knight Professor of Law and the faculty director of the Environmental and Natural Resources Law Program at Oregon Law. She is an award-winning teacher who has taught for more than 20 years in the areas of environmental law, property law, federal Indian law and other subjects. Wood is the co-author of two casebooks, one on natural resources law and the other on the public trust doctrine. She is a frequent speaker on climate crisis and environmental issues. Well, it is good to see a few lawyers on our side. It would be nice to have an ACLU for the environment. Helpful? Yes. Will it save the world from ecological meltdown? Probably not all by itself. Gerald: This sort of thing comes down to arguing for the virtues of incrementalism. We had time for that 40 years ago. It could have bought us some time, though no extractive solution would last forever. But what is in order now is a huge immediate decrease in emissions, and who gets elected with *that* as a plan of action? The amount of change needed would lead to widespread chaos and mass death, as the whole system of supplying food and energy would have to be mostly shut down. We will not change until we are forced to in some manner, and meanwhile the only hope I see is the possibility that even smart as we are, we are not smart enough to see the whole picture. But this is the same kind of hope that keeps people buying lottery tickets..
1. Switch to veganism/non industrialized meat. Not that I’m saying that it will happen. But if it could, we’d have a shot, in my view. And, if we worked together we could do it without too much harm or mass disruption. Not to say it would be easy. But with a plan and leadership it’s doable. Robert: it always comes back to the culture. This culture does not encourage working together cooperatively, it encourages cutthroat competition. I don’t know what kind of miracle could change that in an era of increasing scarcity. But the government won’t, and indeed can’t, do it for us. I don’t think veganism is particularly good for humans. It is unfortunate that we are, as a culture, so insistent that insects are icky. We could be eating a lot of them instead of poisoning them. Yet eating bottom-feeder sea life is still common. Old habits die hard. But trying to change at least is a worthy project. I am an extraordinarily healthy vegan. Don’t listen to the protein propaganda. High amounts of animal protein in the diet is a killer. Heart disease, cancer, obesity all result from excess cell growth due to too much animal protein. Too much animal protein is one thing, none at all quite another. I don’t mean to reject your personal experience, but it’s a big subject. Agriculture is obviously a huge problem. I think you would find that if we discussed this in detail, we would agree on many points, but I don’t want to go off on a tangent. The government could indeed be useful, but at the moment it’s anything but, so it seems foolish to count on it. Ideally we could elect people who would get this show on the road, but that no longer seems possible due to campaign funding law. We are increasingly locked into a necrophiliac culture. But isolationism can’t work, it’s impossible, so working together is the only logical solution. That includes the increasingly powerful corporate interests. They can run but they can’t hide. Are they really so dumb as to believe the future will not adversely affect their descendents? The corporate interests, who put money and profit above anything else, are the source of the current stupidity. Without their meddling, government would be far more effective. Without their monopolization, the power/energy transition would not be so painful. Without their lobbying and propagandizing, individuals would have much more in the way of freedom, choice, and useful information. They’ve puffed up and exaggerated their position to the point that they dwarf entire nations and turn the world into a co-dependent conglomerate of maniacal business factions. They enable people like Murdoch to control 70 percent of the Australian media and the Kochs to distort US and Canadian energy policy. They are the seats of petty tyrants and would-be feudal kings. 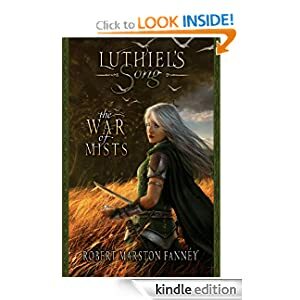 They fight to protect one thing and one thing only — their particular pot of gold. Yes, it would help if powerful corps went whole hog into alternative energy. It would certainly be helpful if big ag went vegan. But if you ask the ones most capable, the fossil fuel companies and the big farms, you hear crickets. Such choices are hard for them and they would prefer to keep wrecking the world doing what they’re doing so long as it guarantees a tidy profit — all compassion be damned. No, the best thing the big corps can do, if they’re not going to help is get our of the frigging way. Robert: You describe the problem well. What is lacking is how these short-sighted corporate interests might be motivated to get out of the way of their target market. One would hope an answer might be forthcoming from those really in the line of fire, people in their 20’s and 30’s. What I see, online at least, is a kind of wholesale buying into and even fetishizing the products of these businesses. How can big ag go vegan when people are fetishizing bacon? And playing Farmville, and discussing what to do when the Zombie Apocalypse arrives. Though the Internet has enabled me to contact some great people and good thinkers, and it’s useful in so many other ways, I sometimes think it’s one of the worst thing humans ever invented. I’d bet a limb the fetishizing of bacon is corporate pr/ad driven. FarmVille and the zombie apocalypse are clearly so. People, in many cases, end up as products of their environments. The internet is an increasingly easy to, through the use of money, manipulate virtual environment. Meme, however poses an Achilles heel for the big guys. So the sword cuts both ways. Which is why bloggers are increasingly threatening to established interests and powerful persons. This serendipitously turned up in my inbox this evening, from another WordPress blogger…speaking of threats to the established order.. I wouldn’t call it control, at least on the absolute sense. But it is certainly a very strong form of manipulation. People can’t make good decisions without good information. So the deception engine pollutes the well, as it were. In any case, we are going to need to learn to work together soon. I don’t see a positive solution that does not include effective government. A photo of law professor, MARY WOOD, holding her book on nature’s trust principles. Empowered citizens” get due process & another new paradigm. Robert, I am guessing, but I am not sure that sweet Mary-of-the-law would know Newton’s laws or anything about the laws of thermodynamics. Mary is trained in the law, but just what laws does Mary know? After finding a reversal of competitive dominance among species of algae in the temperate coastal waters of the northeast Pacific Ocean, researchers believe that global climate change is the direct cause of increased ocean acidification which in turn has altered marine biodiversity. A recent study, published in in the journal Ecology Letters, outlines the competitive dynamics among crustose coralline algae that grow skeletons made of calcium carbonate, living in the waters around Tatoosh Island, Washington. Crustose coralline algae and shellfish find it difficult to produce skeletons and shells when the ocean becomes more acidic due to absorption of carbon dioxide from the atmosphere. This is also an indicator of the impacts of ocean acidification on marine life. Acidification + anoxia is a wretched combo. Woods Hole senior scientist Ken Buesseler with one of the kits citizens scientists can use to monitor radiation in the Pacific Ocean. The Woods Hole Oceanographic Institution launched a crowd-sourced and crowd-funded project yesterday to monitor radiation levels in seawater along the West Coast of North America. Vigorous mixing in the air above large cracks in Arctic sea ice that expose seawater to cold polar air pumps atmospheric mercury down to the surface, finds a NASA field campaign. This process can lead to more of the toxic pollutant entering the food chain, where it can negatively affect the health of fish and animals who eat them, including humans. Scientists measured increased concentrations of mercury near ground level after sea ice off the coast of Barrow, Alaska, cracked, creating open seawater channels called leads. The researchers were in the Arctic for the NASA-led Bromine, Ozone, and Mercury Experiment (BROMEX) in 2012. “None of us had suspected that we would find this kind of process associated with leads,” said Son Nghiem, a scientist at NASA’s Jet Propulsion Laboratory, Pasadena, Calif. Nghiem is the BROMEX principal investigator and a coauthor of a paper reporting the discovery published in Nature on Jan. 15. And why do we have atmospheric mercury?? Thank you coal plants! This I think may be a first..can anyone confirm? Some of the buoys that were left very near the North Pole last spring..totally escaped the Arctic. I think this is a first. Although there was a major Fram Strait flush in 2012 that could have carried off a buoy or two. Might want to ask Neven. But this is the first I’ve seen. Skyepony is a very sharp girl. It’s a great catch. Ice sheet mobility is a direct indicator of fragility. The stuff out there is mostly shattered mush cast about at the whim of wind and current. This is a very good catch. Yes, we’ve never seen this, instruments race out of the Arctic. Like this. The world has changed , and we don’t have clue What’s coming next. Bob: if I could magically promote one meme, it would be about the precautionary principle, and the illusion that any mistake humans make, humans can fix. The illusion of control. Meanwhile, I’m selling stock in a start-up geared towards installing giant fans in the jet stream. Y’know, to get it back on the straight and narrow. I figure people can have them customized and with webcams and then we can have fan races. It will be the next best thing in spectator sports. A man, being human, is locked in a ship with ten other humans. The ship is then set on fire off shore. 1. Give up and go down with the ship. 2. Fight like hell on his own to survive. 3. Attempt to enlist the aid of his fellows in escaping said death trap. Robert: I think your metaphor would work better with a large island than a ship. Because once the ship is on fire, where do you go? To extend the metaphor into reality, what are the lifeboats? In a crisis, you get to the next thing that is likely to keep you alive and then move on from there. The analogy works, because it is seemingly hopeless. But you really don’t know until you act. Alternately..you’re locked *in* a ship that’s on fire? Okay, so first what you do is look for tools to unlock the ship. If you get out, you look for things that will float. If it’s at all cold, you look especially for things you can float on without being submerged yourself, and flares and wool clothing. Since you’re all locked in the ship together, this will go better if there aren’t 200 of you in a ten by ten room. It will also help if any of you know how to recognize tools, thermal clothing, flotation devices. It will help if any of you know anything about the ocean, especially the particular part the ship is in. And it would help if somebody knows how to organize people in a crisis. I’m intentionally leaving out putting out the fire. This metaphor works better for a bad idea than it does for Earth. Baffin Island glaciers in irreversible decline, Pine Island Glacier the same, buoys won’t stay in the Arctic, polar warming wrecks the jet stream, the tundra burns as methane seeps out from polar land and sea. The world is indeed a strange place, my friend. Gearing up for another scary summer. Arctic fire/melt season is probably the most terrifying of all for me. Not looking forward to watching the Barents turn green again. But with all the latent heat and methane, it seems inevitable. I’ll see what I can do RE an article about the buoys and new ice mobility. Will cred you and sky for the catch . Throw in a strong El Niño on top of all that. ENSO-neutral won’t last forever. Still neutral now. The atmosphere to ocean heat transfer system still seems stuck in the ‘on’ position. That’s a good succinct way of describing ENSO. It took me awhile to understand that El Ninos were when warmed water deeper down, surfaced. Also I totally forgot the part about convincing everyone in the ship you’re locked inside, that (a) the ship is on fire, and (b) it’s not so good to be locked inside a ship. That comes first. Thanks for the intellectual exercise. You never know for certain if a crisis is hopeless until you exhaust all your resources through action (or by failing to act, come to die). In the analogy, we don’t know how far the boat is off shore. We don’t know the water conditions. We don’t know the proximity of potential rescuers. We don’t know if there is a means to communicate with potential rescuers. All we know for certain is that if we do not do something to get out of the ship, we’re done for. But it is pretty darn certain, if we keep on doing what we’re doing, that the end here is very, very bad. I do not understand why Arctic atmospheric Methane increases during the coldest months…….??? During the Arctic winter, the jet stream is generally stronger because of the larger temperature differential. The stronger the jet stream surrounding the Arctic the lower the ability of the Arctic Methane to escape down towards the equator. Less Arctic ice during summer should release more Methane, but a weaker jet stream should allow more of it to escape. Regarding veganism, I was born a vegan, but came to this country at the age of 17 and then starting meat to keep up the protein level, but just a tiny fraction (< 5%) of my diet consists of nonvegan food (and most of this is chicken, never seafood). So this means that in a given year, I eat < 36 nonvegan meals (assuming I average 2 meals/day, it actually is about 1 meal every ten days). So while this is not 100% veganism, I find no matter where I am in the US I can keep my protein at adequate levels. I agree with the vegan philosophy and in certain countries of the world it's *easy* to be 100% vegan and in certain other places it's not that easy but it can be done with a 95% vegan diet (at least for me, to not suffer from muscle weakness). So 5, 10, or even 20% reduction would represent a huge difference from 1+ billion cows to 200 million cows. That itself would cut emissions significantly. Yet the problem is getting everyone to go on board with this. If the rest of us had this pattern of consumption, we’d be much better off. At 2 meat meals per week, you also don’t have to worry about vitamin B levels through supplements, wild foraging, sea veggies or garden veggies. I’d also recommend those concerned about sustainability cut back on milk products, considering them a luxury item (also consuming them once or twice per week). At your rate of 36 meals per year, you’re probably helping far more than hurting. For me, I’m pretty much pure vegan as I’ve gotten it down to a bit of a science and I live in the US. In any case, I’ve had more than my allotment of meat over the years, having grown up as a non-vegan. So I figure I’m doing the responsible thing and giving some back. I live in the US as well, but I started my schooling in Ohio at the age of 17, where they looked at me funny when I said I was 100% vegan (not even eggs) coming from India (where my entire family is 100% vegan still). This was back in 1990. So I started to eat some meat but then cut back as I moved around and it’s easy now to stay 95% vegan (in Seattle) as I’ve said and still not worry as I travel a lot and don’t always have a choice in the matter as to what and where I eat. Your outlook on giving back is a good one: I feel that about many things (alcohol, etc.). I’ve done more of it than I should and least I can do is stop since I can’t take it back. My motto in life is to give back to the world more than I take from it. What I’ve observed is that people don’t really want to give up their luxuries even as they appreciate the effects of AGW. What I’ve tried to is convince people they don’t have to give it up 100% – 95% would be adequate, and that it’s multidimensional – so they may reduce their meat consumption to 90% of prior year average, but they could get their 70″ TV in exchange and this is easier for people to accept. But still, even with this, getting enough people to buy in is hard. I am challenging my family to always lead more minimalist lifestyles but it’s hard in many ways. Basically we all need to reduce our carbon footprints by 80% at least and possibly 95% for humanity to survive in the long term one way or another. If you look at Kevin Anderson’s work in this regard, it’s very clear what needs to be done and by when. Hansen has outlined some choices as well and I guess Mann has weighed in on this topic most recently. I don’t think this is too hard at this point if you buy into the greenhouse gas theory. My view is we need to hit this on all levels, from the individual to the international. From consumption to how and what we produce. If we brought consumption and luxuries down through individual choice and shifted energy to renewables, food to mostly veg/sustainable, and started to bend the population curve down, then we might have a chance.